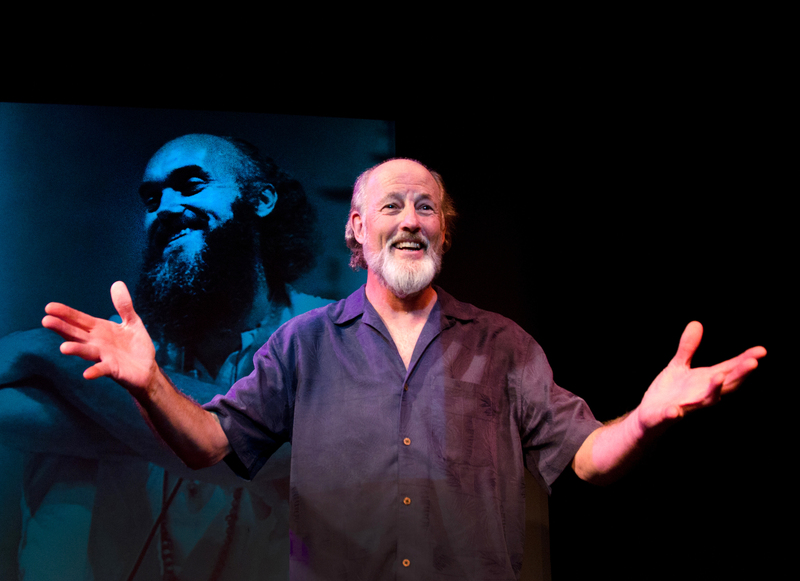 In “Acid Test, the Many Incarnations of Ram Dass,” playwright Lynne Kaufman opens a window into the wild world of Richard Alpert, the Harvard professor and pioneer of the 60s LSD scene. As Alpert, solo actor Warren David Keith floats from his comfy living room chair to sitting cross-legged on the floor. Keith relives key moments in Alpert’s psychedelic journey, as we lean forward, hypnotized by his otherworldly experiences. We laugh and marvel in the presence of a master storyteller, his tales unbelievable, but too specific to be fabricated. “The Many Incarnations of Ram Dass” takes us through Alpert’s relationship with psychedelic scientist Timothy Leary, his travels in India, his encounters with Hinduism, and his becoming the guru, Ram Dass. You may recall Ram Dass as the author of the wildly popular 1971 psychedelic manifesto Be Here Now. 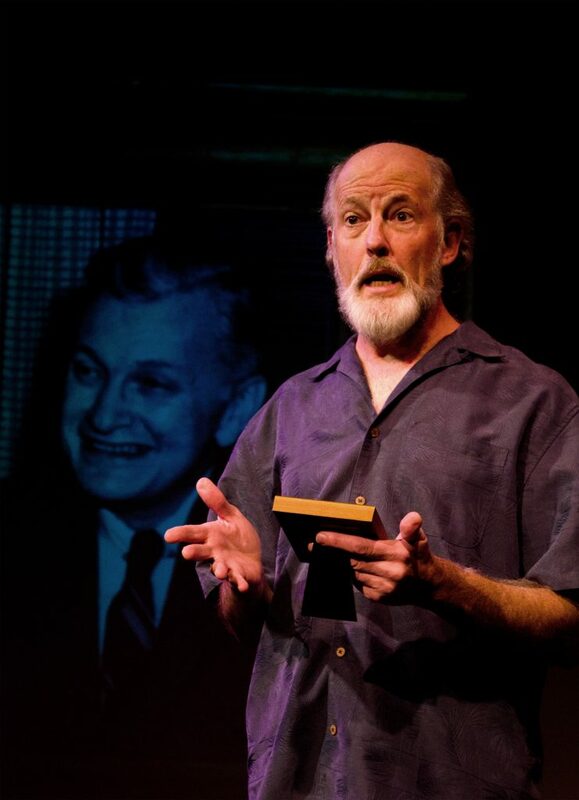 The play takes us to Alpert’s current life as an 87 year old, post-stroke teacher, still active in the enlightenment community. As we listen to Alpert’s adventures, we realize that the word “incarnation” fits his life perfectly, for his experiences could well be called “separate lives”—for their drastic variations. “Acid Test” asks an existential question: How can we connect our many perceptions of ourselves, when life splits up into distinctive chapters? We say: “I was a different person back then.” “Everything changed when this happened…” How do we tie it all together into a cohesive life, and take ownership of ALL our experiences? What is the point of life, what are we striving towards? Kaufman succeeds in articulating the feeling of enlightenment, the “answer” one encounters when tripping on psychedelics. We have all felt this contentment, even without drugs. In his “studies” Alpert discovers that the feeling can also be accomplished through religion. “It makes sense that God comes to Western society in a drug,” Guru Neem Kalori Baba says to Alpert in the mountains. “You are such a materialistic society.” There is something that connects all of us, and Kaufman’s Ram Dass guides us towards truth. We millennials think we’re cool with our effortless navigation of the internet and amazing technological innovations. But in our connected world, questions about identity still haunt us. At The Marsh, Ram Dass helps us touch base with the universe, marveling at stories from the other side. Listening, after all, is the first step towards BEING HERE NOW. There are many roads to total “present-ness.” Love, religion, and perhaps even psychedelics can guide us. Kaufman shines a mature, artistic spotlight on the goal. “Refugee Voices & Trojan Women” Awakens Our Empathy, at Multi Ethnic Theater, S.F.